The emergence of smart devices (e.g., smart watches and smart eyewear) is redefining mobile interaction from the solo performance of a smart phone, to a symphony of multiple devices. 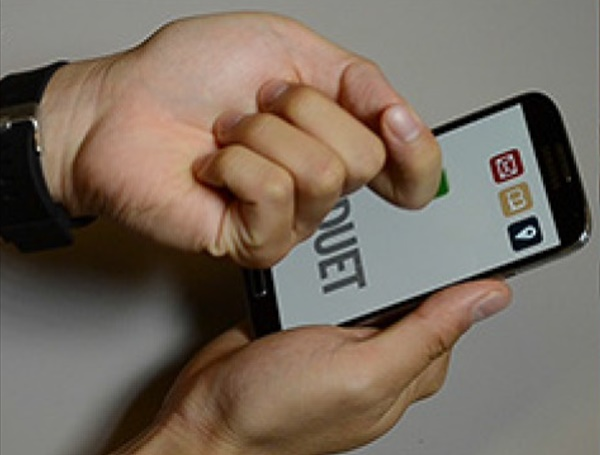 In this paper, we present Duet – an interactive system that explores a design space of interactions between a smart phone and a smart watch. Based on the devices’ spatial configurations, Duet coordinates their motion and touch input, and extends their visual and tactile output to one another. This allows us to transform the watch into an active element that enhances a wide range of phone-based interactive tasks, and enables a new class of multi-device gestures and sensing techniques. A technical evaluation shows the accuracy of these gestures and sensing techniques, and a subjective study on the Duet system provides insights, observations, and guidance for future work.